One of the toughest aspects of beginning college at age 12 is just getting people to believe you’re up for the challenge. That’s according to Simone Evans ’19 (Biochemistry; Mathematics) of Wurtsboro, New York, who in 2014 enrolled part-time at Ulster County Community College. Evans proved the believers right at Ulster. In 2016, she earned an associate’s degree in math with a 4.0 GPA, and made plans to transfer to a four-year institution where she could do something related to medical research. Evans declared as a double major so she could continue her studies in math, and eventually connected with Anca Rădulescu, assistant professor of mathematics, who empowered her to produce her own original scholarship. The two began doing research together in the summer of 2017. “She was really helpful both as a research mentor and an academic advisor,” Evans said. The summer research was made possible in part by the Robert Kyncl ’95 and Luz Avila Kyncl ’96 STEM Experiential Learning Fund, a scholarship established by New Paltz alumni that makes once-in-a-lifetime experiential learning opportunities attainable for students in computer science and computer engineering, including undergraduate research, study abroad and industry internships. Evans was 16 years old when a paper she co-authored with Rădulescu, “Asymptotic sets in networks of coupled quadratic nodes,” was published in Oxford University Press’s Journal of Complex Networks. Evans found success on the biochemistry side as well, serving as a teaching assistant and tutor for the Chemistry Department and building strong relationships with faculty, including Preeti Dhar, professor of chemistry, and Spencer Mass, biology instructor and advisor for the College’s Pre-Medical program. “I think that’s the thing I’ve liked most about New Paltz: almost all of the classes are fairly small, so you can get a really good working relationship with your professor,” Evans said. As a member of the Honors Program, Evans took advantage of unique interdisciplinary course options, and made friends she may never have met otherwise. While she never lived on-campus during her time at New Paltz (“I have awesome parents who drive me places”), Evans said she still got to enjoy “the college experience,” and credited those who made it easy for her to fit in. “Being a younger student, most of the people I meet here are just like ‘Oh, that’s cool, how did you get here?’ which helped me feel like just a regular student,” she said. Now 17, Evans will celebrate her accomplishments alongside fellow members of the SUNY New Paltz Class of 2019 at the Undergraduate Commencement ceremony on May 19. 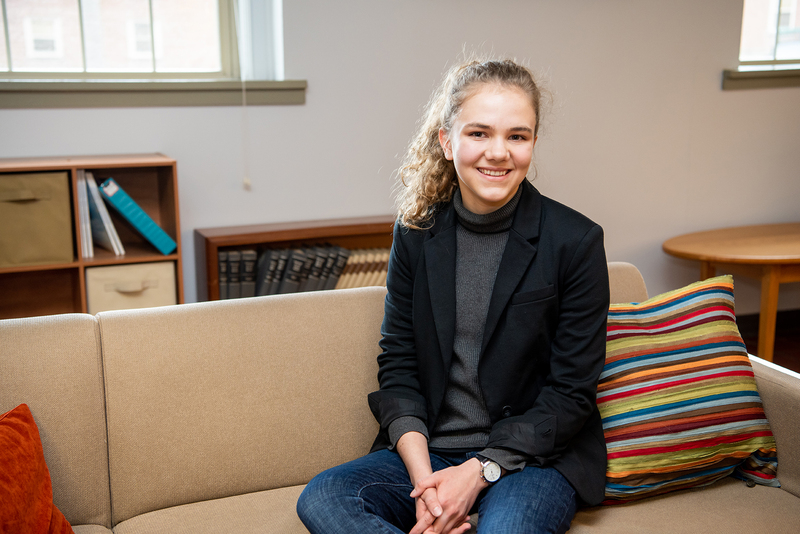 She’s looking forward to a summer study abroad opportunity with Global Medical Brigades, and has been accepted to Dartmouth University’s Ph.D. program in experimental and molecular medicine, where she will concentrate on neuroscience.